Communication between animals is an issue still on research especially because of the imprecise meaning of the word “communication” in this context. But in short, it is true that some animal species use their intelligence and senses to warn, prevent and find a mate with whom to mate; this means that they can communicate in a very particular way. In the case of sharks, they are known to have shown curiosity and tendency to play and can communicate to defend or share food by using their senses of sight, hearing, smell and electro-perception. The most significant reason they have to do this is their need to get a partner. There is a problem that prevents the observation of sharks to study their communicative habits and is that many individuals are solitary creatures. Most can detect low sound frequencies and weak electrical signals detected by their Lorenzini ampoules. Sharks live in groups called “schools, ” and it is common for them to communicate with each other either by sight or by arching their body. This kind of communication is common in the gray reef shark (Carcharhinus amblyrhynchos), which also perceives its surroundings thanks to its excellent smell sense and a sharp ear. Olfactory communication channels are necessary for reproduction and the location of prey. As their nostrils are distant from each other, they take advantage of the time it takes the smell to reach each olfactory canal to examine where is the origin of the scent they perceive. 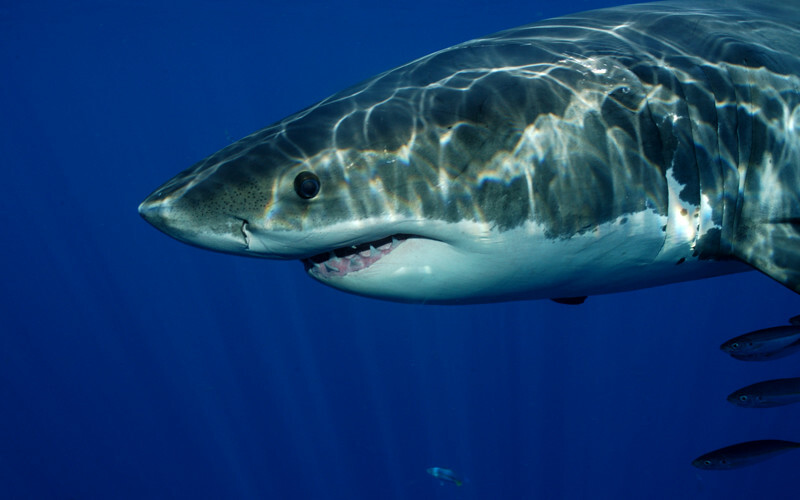 One of the most common communicative strategies among sharks is aggression towards other individuals at the time of feeding, driven by the frenzy of the act. They are more likely to physically attack during “Lunchtime” than when defending their territory. Most can detect low sound frequencies and weak electrical signals. They also send non-verbal messages by performing some actions. For example, when the males are about to mate, they hold the female tightly and can bite it on the back, as if to say, “Stop, not yet.” Other species such as the Draughtsboard shark (Cephaloscyllium isabellum) can inflate its body when faced by a predator. Although there is information indicating that these animals use their body movements to externalize their aggressive intentions, there is not much information about other methods of communication. Sharks can produce sounds but no vocalizations because they lack the necessary organs to emit sounds from the throat. Some reports from New Zealand say that the whale shark (Rhincodon typus) “barks like a dog” but there is not much information about this, and there is not a scientific confirmation either.